The cleanliness of your business is absolutely essential to make a good impression on your patrons and clients. No one wants to walk into an establishment that is filthy and not taken care of properly. A dirty establishment reflects poorly on the owners and gives the impression that the business is not very professional. The cleanliness and presence of your business are crucial to its success. Keeping your floors clean is one of the first things you should take care of, as flooring is often the first thing that people notice when they walk into an office, restaurant, care facility or other business. Use the services of a commercial tile cleaning company to deep steam clean and help maintain the cleanliness of your flooring. Not only does a clean floor look good, but it also improves the air quality within your business. Any germs or bacteria lurking within the grout of your tiles can enter the air particles and create a hazard for all those employees and customers who spend time within the building. 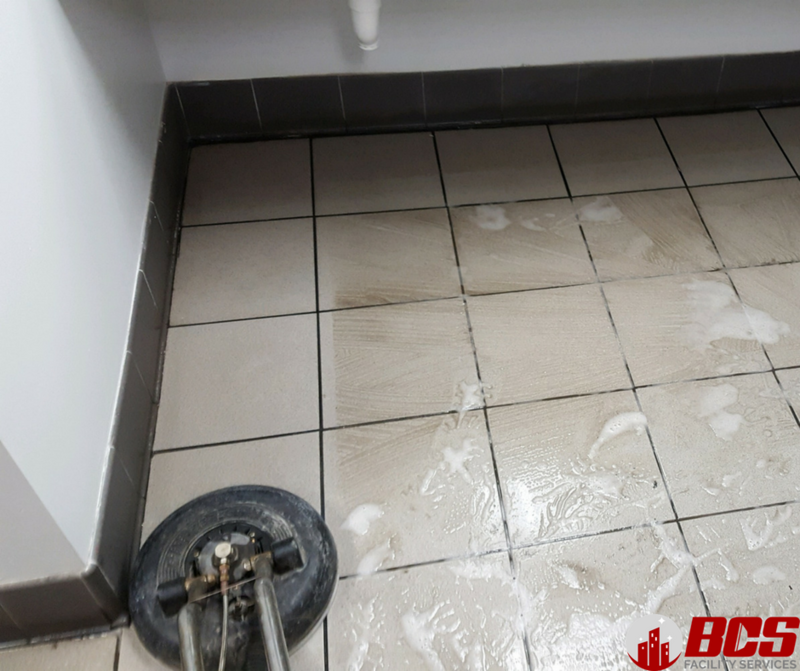 This is why it is essential to deep clean your floors when necessary, and maintain the cleanliness and sanitation of your tiles on a regular basis. You will be able to find that a professional tile cleaning company has highly trained technicians ready to blast away years’ worth of dirt, grime and filth from the grout of your tiles. They have been certified and specially trained to ensure that their work is highly qualified. They are prompt, courteous, and highly skilled. They choose the correct cleaning products and are use state-of-the-art cleaning equipment to deep clean your floors. Have dirty grout? They can clean the grout or even change the color to give your floors a new appearance. Our technicians from our professional tile cleaning company will assess the condition of your floors to determine the exact cleaning method that would be most beneficial. Our rotary, high-pressure extraction tools will get rid of the toughest stains and grime with the help of powerful and environmentally-friendly cleaning supplies. These cleaning solutions will not leave any offensive odors behind – only gleaming floors. When you hire our tile cleaning solution services, one thing you should be assured of is that we will not use any abrasive cleaner on the floor because it will ruin your tiles permanently. Instead, a soft solution manufactured for cleaning tile floors is used. After using the solution, we use a hot water rinse with high pressure and a professional vacuum system. A combination of such method and technology is able to guarantee that the surface will be left clean and there will be no problem removing any built-up dirt and grime. Since the cleaning services use a vacuum system that is properly enclosed for protection, there is no need to worry about carpets, cabinets, furniture, and fixtures. Again, tile cleaning solution is only carried out by people who are highly trained and are also well aware of the importance of taking proper care of your property.